Buddhism is a dharmic non-theistic religion that is focused on the teachings of Siddharta Gautama, known as "Gautama Buddha" who was born and lived in ancient India/Nepal around the 5th century BCE. The religion subsequently spread widely in Asia and later spread around the world gaining adherents in all the continents. Today, the largest Buddhist populations are found in the Indian subcontinent, China, Tibet, Japan and Southeast Asia. The exact number of Buddhists is unknown, but typical estimates range from between 230 and 500 million, making it the fourth-largest (by population) organized religion in the world (after Christianity, Islam and Hinduism). There are also many people who incorporate elements of Buddhism into their religious practices or beliefs - so if these too are classified as Buddhists, then there are perhaps more than 1.5 billion Buddhists in the world - making it the largest religion in the world. What is the Buddhist religion about? What do Buddhists believe? What is the history of Buddhism? How many Buddhists are there? Where do they live? What are the different schools of Buddhism? Where can I learn more about Buddhism? 7 x 7 x 5 Inch Resin Happy Praying Buddha Figurine. Decorative mini Zen garden gift set that is perfect for home, office, or gift for love ones. Arrange this personal zen garden and bring peace and harmony to your body and spirit. Approximate Dimensions: 14" W X 5.25" H X 5" D.
Relax, de-stress, and decorate your space with this beautiful and peaceful zen garden set. Featuring a Buddha statue, 2 lotus-shaped candle holders, incense burning jar, 2 incense sticks, a sand rake, sand, and a black wooden tray. Simply take hold of the rake and comb it through the fine white sand to add a touch of relaxation and a moment of zen to any part of your day. Measuring at 10.5-inches tall, this gorgeous statue is a stunning representation of Shakyamuni Buddha, the sage who founded Buddhism and its teachings. He is regarded as the Supreme Buddha in most Buddhist traditions and known as "the enlightened one" or "the awakened". This product is made with cold cast bronze, individually polished, antiqued, and painted with color accents, the definition and the intricate details of this piece are simply breathtaking. The special production process of this piece, originated from Great Britain, uses actual bronze powder mixed in the cold cast resin in order to ensure a richer, more life-like presentation. Add peace, tranquility and feng shui to your home, office, garden, yoga studio or meditation space with this decorative Buddha statue. This 11 inch figurine is perfect for perching atop a table, desk or shelf for adding Asian flair. A dark gray textured finish gives the appearance of stone. This collectible is made of durable Polyresin, making it ideal for indoor and outdoor use. No matter where you feature this elegant statue. it will add an ambiance of a zen-like state to any space. hai Buddha Meditating Peace Harmony Statue. 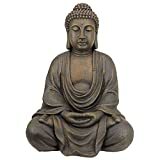 Enhance your home and garden by this grace full Buddha Statue symbol of peace and harmony. Statue is in meditating pose. This statue is 8 inches tall x 6 inches wide and made in polystone material. Statue color is black with silver robe. Our medium Zen Buddha figurine measures 20"Wx15"Dx26"H. 19 lbs. making it the perfect home or meditation garden decoration! Sculpted with the tranquil majesty of those in ancient monasteries, this three-dimensional work of decorative Asian art creates a meditative place for home or garden. Our Design Toscano-exclusive, quality designer resin statue with stone finish captures the faux distressing that lends the appearance of an aged Asian antique. The peaceful Oriental Buddhist nature of this sculpture lends its quiet countenance to home or garden sanctuary. Another breathtaking Asian garden statue from Toscano! 20"Wx15"Dx26"H. 19 lbs. 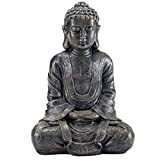 This gorgeous Buddhist Healing Medicine Buddha Religious Buddhism Statue Figurine has the finest details and highest quality you will find anywhere. The Buddhist Healing Medicine Buddha Religious Buddhism Statue Figurine is truly remarkable. Product is crafted with: Resin. ITEM SKU: SS-Y-7820. Made In China. This lovely rendition of the Royal White Buddha measures aprox 12". 4” Buddha Statue/Idol/Decorative Figurine: Poly Marble with White Marble Finish – PREMIUM QUALITY Buddha Idol in Meditation Pose. Attractive & Serene Small Buddha Statue. No compromise on QUALITY! Made of poly marble. Measure 4" Tall. 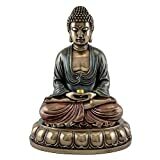 Enhance your home and office by this grace full Buddha Statue symbol of peace and harmony. We hope this brings lots of peace and happiness to your life! No compromise on QUALITY! Made of poly marble. Sculpted in great detail with white marble finish. Excellent craftsmanship with serene details - Marble White Finish. Perfect gift for loved ones, fengshui. Enhance your home and office by this grace full Buddha Statue symbol of peace and harmony. May this Serene Statue bring you peace and happiness. Very Attractive Buddha Statue for your desk, home, temple, garden, etc.